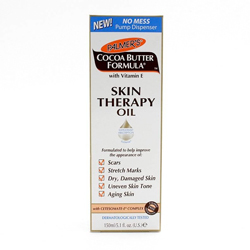 My skin is very weak, and I have been using products for stretch marks for a long time. 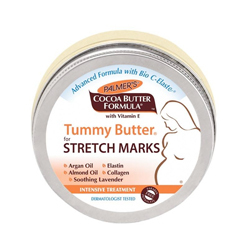 About 2 years ago someone recommended me to use Palmers' Tummy butter, and later, I discovered the oil from the same line. These products do not make magic, they will not make the striae that we already have many years ago disappear, what they do is give it a better look, and prevent new grooves from coming out. (IMPORTANT: if the stretch marks are just appearing if you can disappear them, at least it worked for me). It makes them softer, not so perceptible to the touch, this because it deeply hydrates the skin. They help eliminate redness, and camouflage them a bit with your skin color. I used them every night before going to sleep, waiting a few minutes for them to dry before I went to bed. I alternated them with one another according to the day. On Monday I used the oil, and on Tuesday the butter, and so on all week. They can be used alone without any problem, but my skin is very dry, and I prefer to moisturize it as much as I can. What I like least? It takes a while to dry, but the reward is worth it! They recommended it to me, and now I recommend it to you with your eyes closed. They do not have a strong smell, they do not bother the texture, and they are cheap. REMEMBER: The stretch marks are completely normal, and are not a source of embarrassment. So put on your bikini And wear that body!